This was the last stop on our tour of Vermont breweries in July. 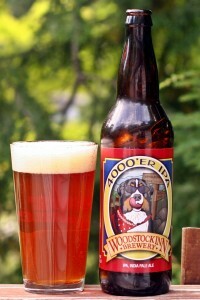 Had a nice trip back through New Hampshire including the Kancamangus Highway from Woodstock Brewery back to Conway, NH. This is a great drive if you have not done it in the past I would absolutely recommend you do so, especially with fall coming this would be an incredible drive. This beer was not on tap in the brewery but we were able to grab a couple of bottles on the way out which was fine with me. Color is typical of an IPA, nice orange and the head is off white but ample. Aroma is very mild for an IPA and it leans more towards the malts than the hops which is unusual. Taste is OK but nothing too special, leans more towards the herbal hops than the tropical or fruity type. Well balanced beer with plenty of malts to offset the hops but I had hoped for more.